Last night before an audience of more than 1,000 guests, the U.S. 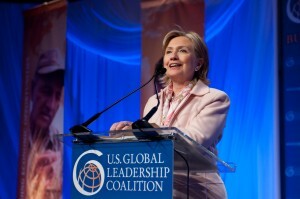 Global Leadership Coalition – an MFAN partner composed of 400 public- and private-sector leaders and organizations – honored Secretary of State Hillary Clinton for her lifelong commitment to public service and her efforts to elevate America’s smart power tools of development and diplomacy. 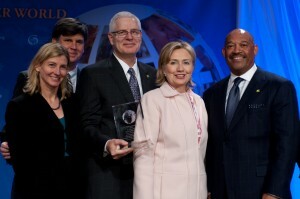 (L) MFAN Principals Nancy Lindborg of Mercy Corps and Bill Lane of Caterpillar, Inc.
Sec. Clinton also acknowledged the new faces of the Millennium Challenge Corporation and the U.S. Agency for International Development (USAID), Mr. Daniel Yohannes and Dr. Rajiv Shah, respectively. “Development is and must remain the key. And I am delighted that with me tonight are two of our new leaders. 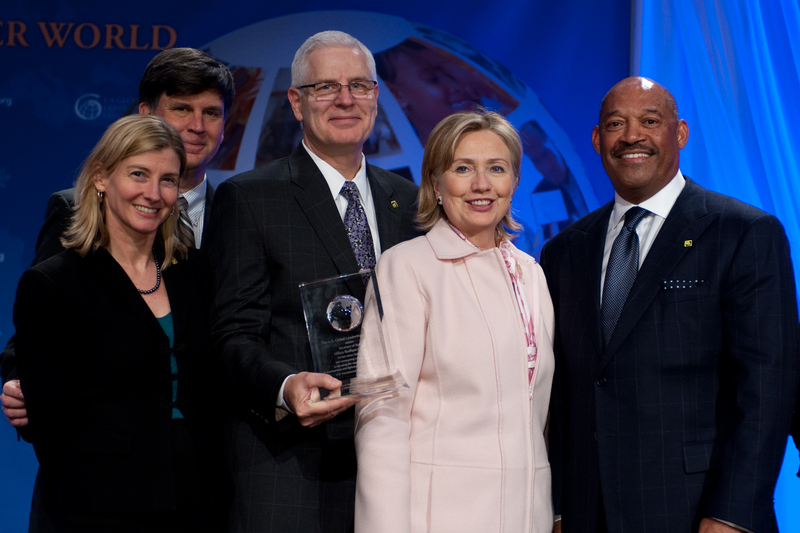 I hope you’ll get to meet Daniel Yohannes, who is sitting right here, who is the new president of the Millennium Challenge Corporation. Daniel came to this country from Ethiopia as a young, young man, took advantage of the extraordinary opportunities available in America, pursued his dreams, fulfilled them, became very successful, and now is giving back.